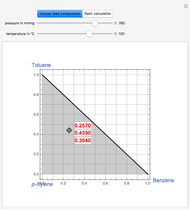 Consider a ternary mixture of benzene, toluene, and -xylene (BTX). 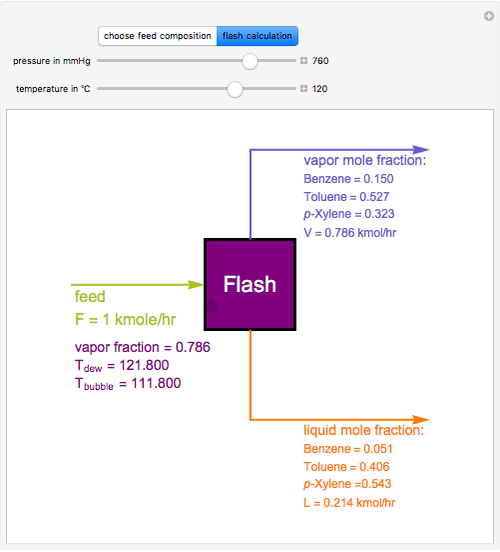 For this ideal system, vapor-liquid equilibrium data can be computed using Raoult's law, , where is the vapor pressure of component given by Antoine's equation, is the total pressure, and and are the liquid and vapor phase mole fraction of component . You can select a feed composition by dragging the locator in the ternary triangular diagram (i.e. inside the light blue region) and you can vary the values of (expressed in mmHg) and (expressed in °C). 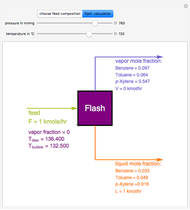 This Demonstration computes the vapor fraction of the feed and the composition of the liquid and vapor streams leaving the isothermal flash drum. Only when will the feed be a two-phase mixture such that . Housam Binous, Mamdouh Al-Harthi, and Brian G. Higgins "Flash Distillation of a Benzene, Toluene, -Xylene Mixture"